I’ve been tinkering around with this circuit on my breadboard. It’s the Fuzz Unit from Music Projects by R.A. Penfold, 1994. Two parallel signal paths, a clipping style fuzz and an adjustable gain stage, are both fed into a voltage controlled amplifier (VCA). 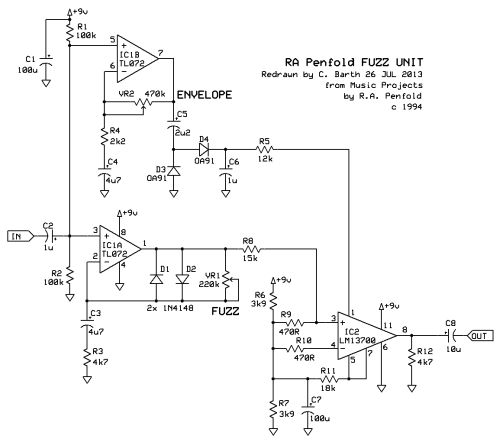 The fuzz goes to the VCA’s input and the gain stage goes to the VCA’s control pin. You can find details about this project at Viva Analog. I went a little further by adding an envelope follower (based roughly on the envelope follower in the Lovetone Meatball) and a CV input that allows you to insert an external modulation source (ie. external LFO, sequencer, CV foot pedal, etc…).